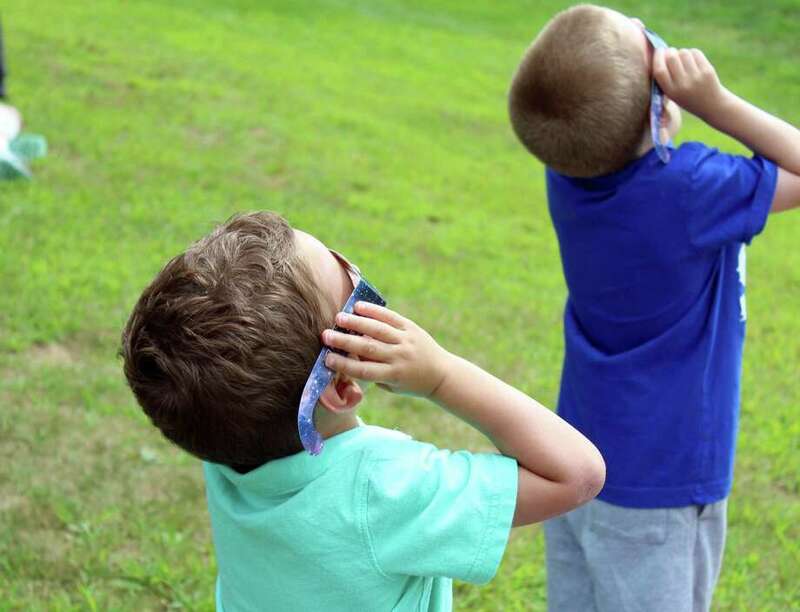 FAIRFIELD —Solar eclipse watchers converged on the soccer field behind Fairfield Woods Middle School Monday afternoon, most of them among the lucky 600 who secured a pair of special viewing glasses through the Fairfield Woods Branch Library. The branch was one of 75 libraries across the country that won a grant from NASA at My Library to provide the glasses, along with raffle prizes dealing, of course, with space. There was a waiting list of 100 people for the glasses. She may have been right. As the moon was inching across the sun, many of the kids at the soccer field were running around, playing catch, and tossing Frisbees. Parents could constantly be heard admonishing their children to not look at the sun without the special glasses. Although Fairfield didn’t lie in the so-called path of totality, viewers witnessed a partial eclipse — hitting roughly 70-percent coverage — that began at 1:24 p.m. and peaked at 2:45 p.m. The skies took on a hazy, evening-like hue under thins clouds, and the oppressive heat and humidity lessened slightly. Five-year-old Matthew Peregolise, came from Easton with his mom, Leah, and younger brother, Sean, 3. Leah Peregolise said she registered for the eclipse viewing just last week, and admitted she was a bit worried about the kids keeping the glasses on. “We’ve been talking about this for a long time,” she said. As the moon crept across the sun, Matthew held his glasses tight to his eyes. “I can see the moon. It looks like the sun is getting closer,” he said. Caellum Liceago, 8, liked the eclipse party. “This is actually better than just looking at the regular sun,” Caellum said. Attendees could also made a glow-in-the-dark bracelet, draw a corona around the sun, and make a flip book of the eclipse.